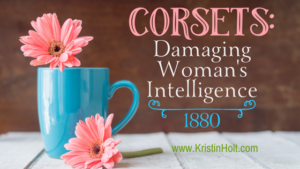 The author, an eminent physician from London, England, explained why corsets were so damaging to a woman’s health. Specifically, he argued, to her brain-power. 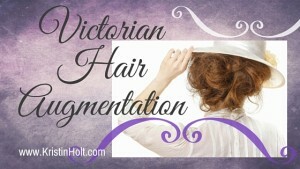 Dr. Richardson was far from the only authority who spoke loudly against the tight lacing of corsets–and corsets at all. 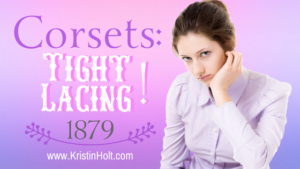 I’ve read citations from other men in the late 19th century condemning the wearing of corsets, who admitted they could not persuade their own wives and daughters to forego the dangerous practice. 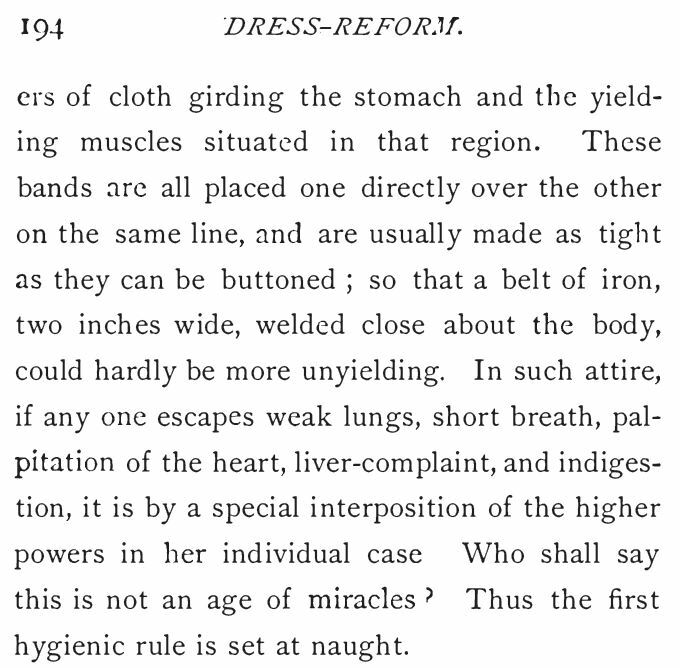 Fashion had that tight of a hold over the women. 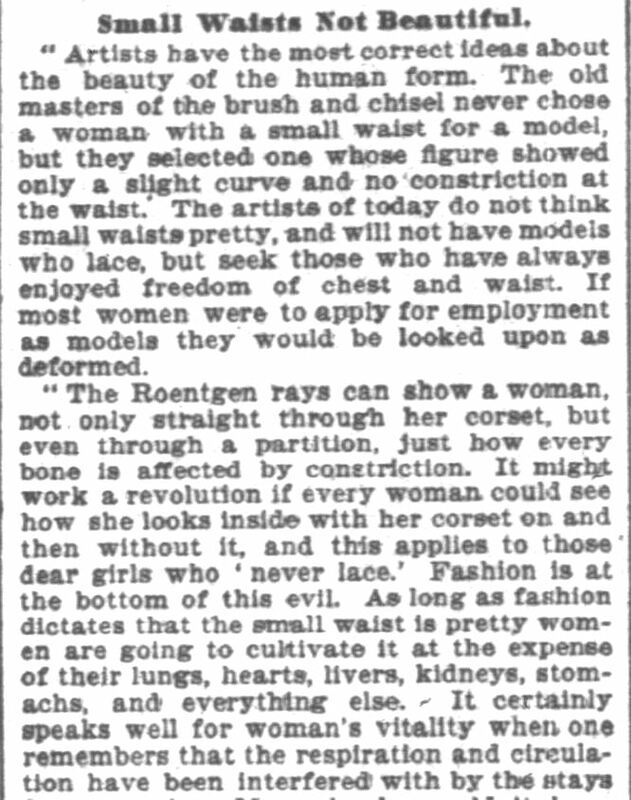 Nineteenth Century fashions, focused on how tiny the waist could be made (and made to appear), required tight lacing to gain the effects so eagerly sought. 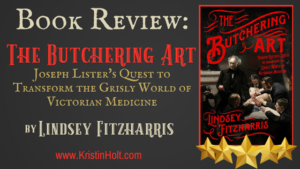 Just how much pressure would have to be exerted upon a young girl’s ribs to force them to change their natural shape…and then to remain so constricted? 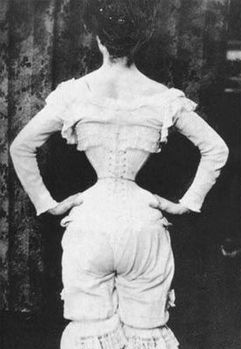 Tiny corseted waist. Image: Courtesy of Pinterest. Throughout time, advertisements have always argued their side of the story… even when it’s largely lacking in scientific basis (or truth). 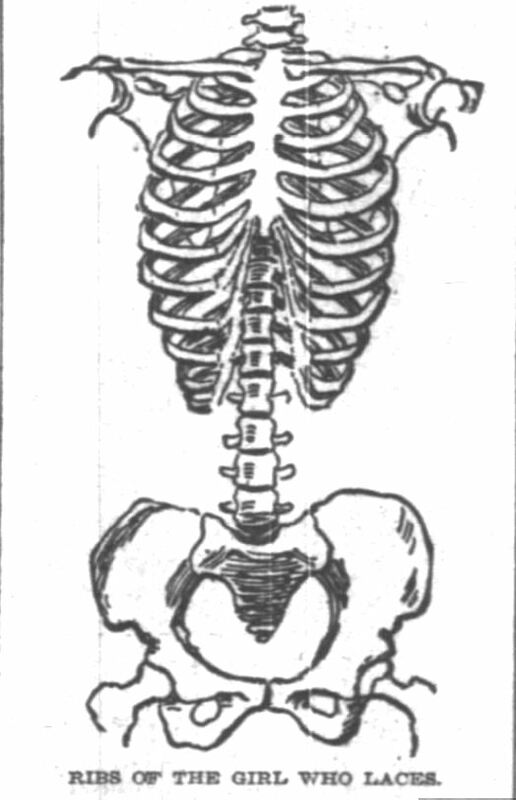 Maternity Corset advertisements argued that such a contraption was necessary for a healthy baby and safe pregnancy. 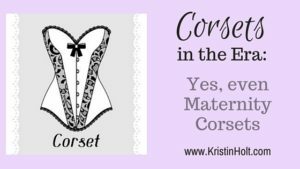 Most women wanted a healthy child and good outcome, so they continued to wear what their mother’s insisted upon: laces (corsets). 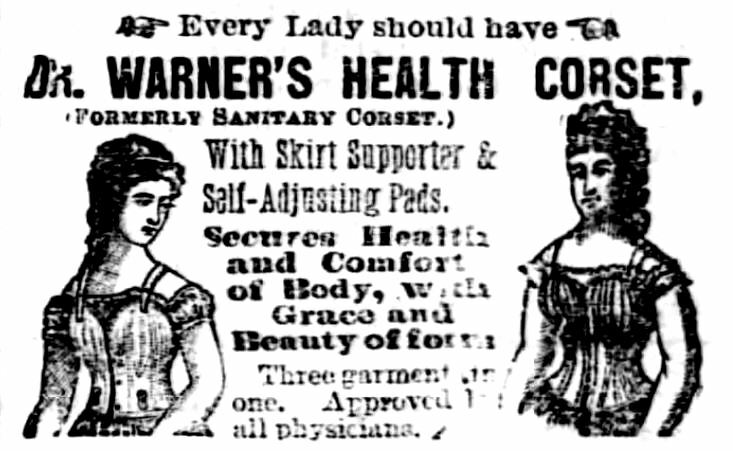 Dr. Warner’s “Health Corset”, advertisement published in Staunton Spectator of Staunton, Virginia on January 2, 1877. 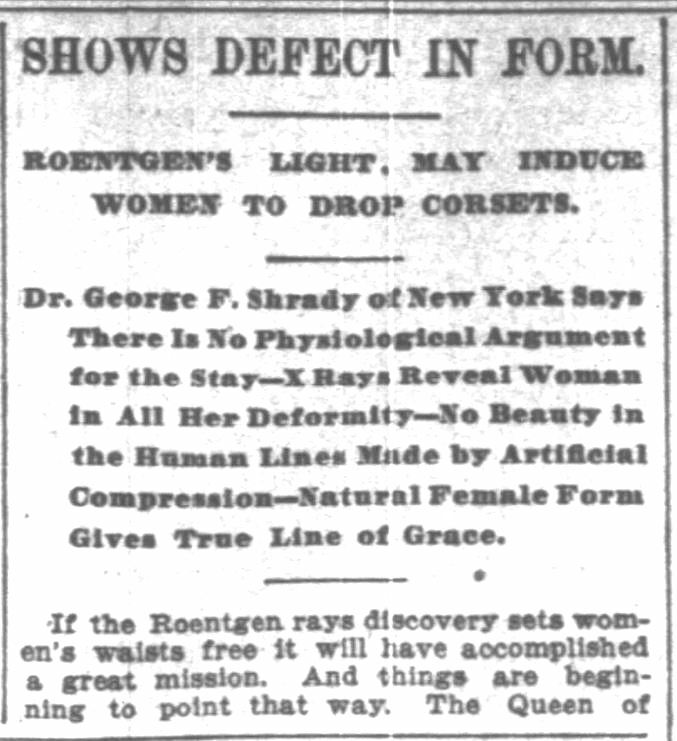 Ball’s Health Preserving Corsets, made/distributed by Chicago Corset Company, states in their newspaper advertisements, in the product’s name, that their corset preserves health. Who doesn’t want their health to last? 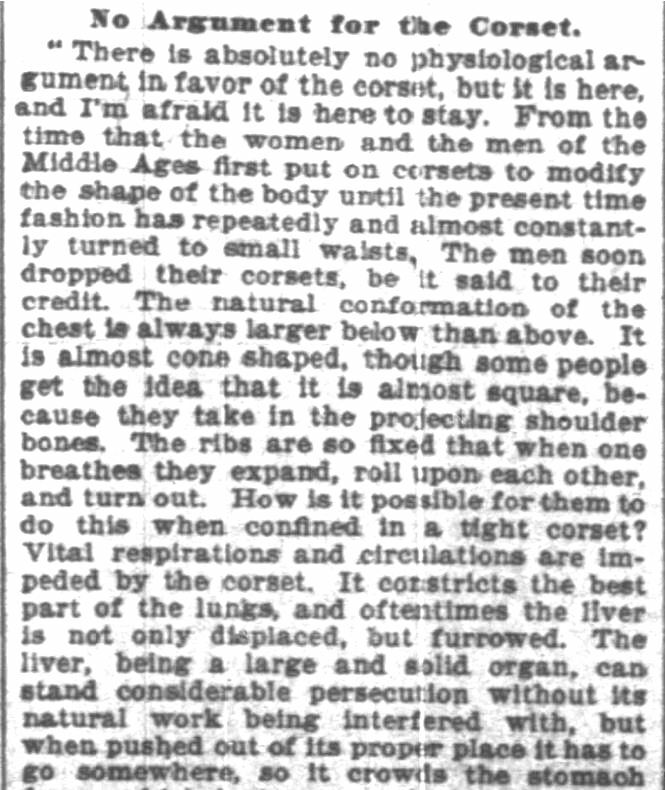 Ball’s “Health Preserving” Corsets, advertised in Democrat and Chronicle of Rochester, New York on September 8, 1885. 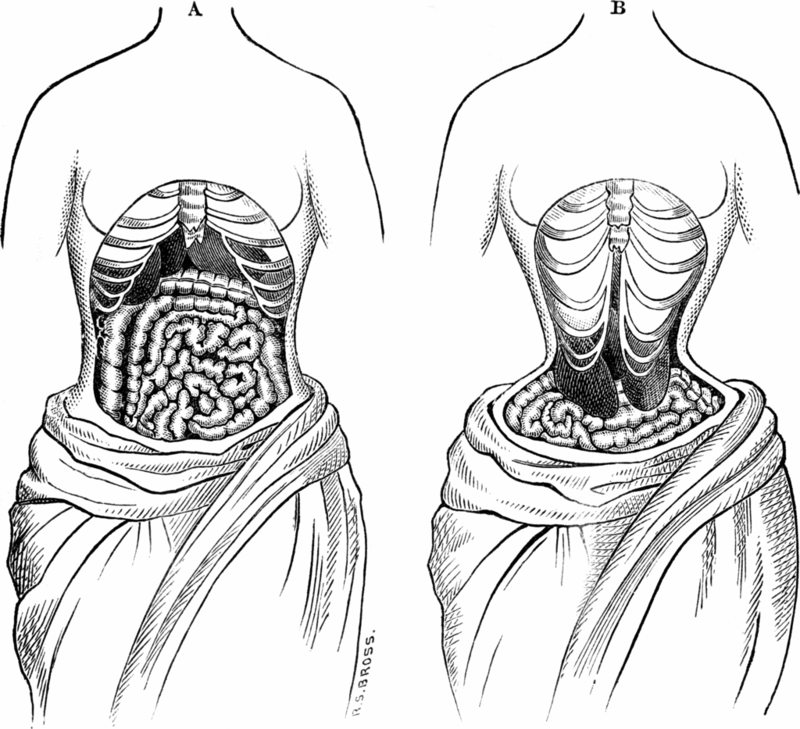 Two sketches from 1884 depicting what, at the time, was believed the way the inside of the body looked when wearing a corset. Image: Wikipedia, Public Domain. 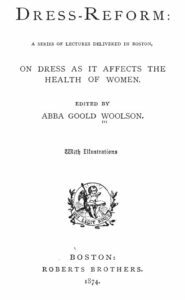 TITLE PAGE, Dress-Reform: A Series of Lectures Delivered in Boston on Dress as it Affects the Health of Women, 1874. ONE MORE VOICE OF REASON. 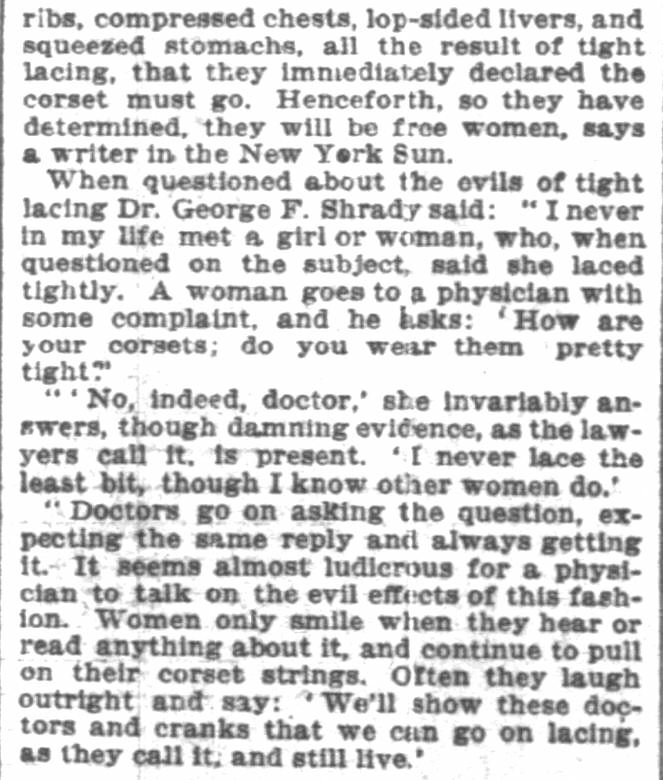 Chicago Daily Tribune of Chicago, Illinois on April 24, 1897. Part 1. Chicago Daily Tribune of Chicago, Illinois on April 24, 1897. Part 2. Chicago Daily Tribune of Chicago, Illinois on April 24, 1897. Part 3. 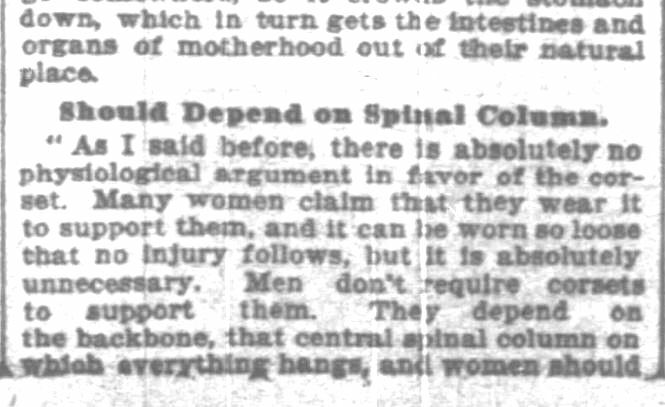 Chicago Daily Tribune of Chicago, Illinois on April 24, 1897. Part 4. Chicago Daily Tribune of Chicago, Illinois on April 24, 1897. Part 5. Chicago Daily Tribune of Chicago, Illinois on April 24, 1897. Part 6. 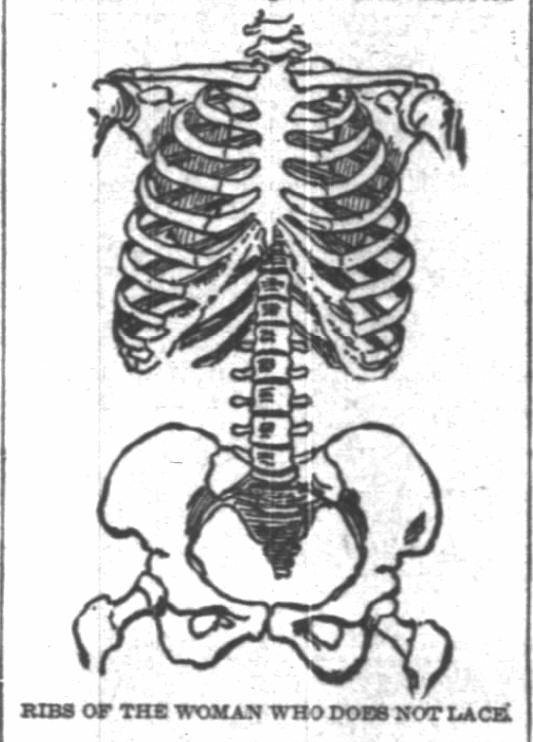 Chicago Daily Tribune of Chicago, Illinois on April 24, 1897. Part 7. Chicago Daily Tribune of Chicago, Illinois on April 24, 1897. Part 8. Chicago Daily Tribune of Chicago, Illinois on April 24, 1897. Part 9. 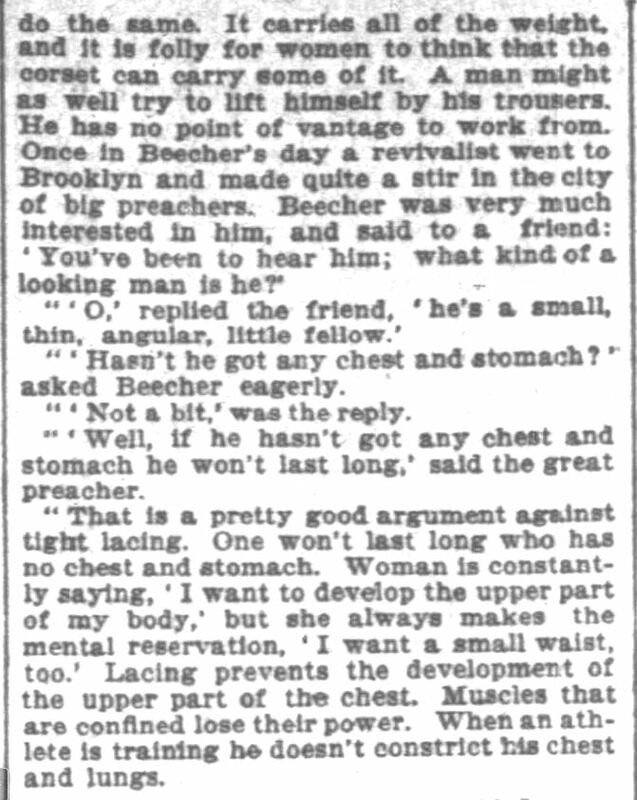 Chicago Daily Tribune of Chicago, Illinois on April 24, 1897. Part 10. 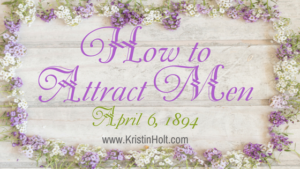 Thank you, Kristin, for another wonderfully informative article. 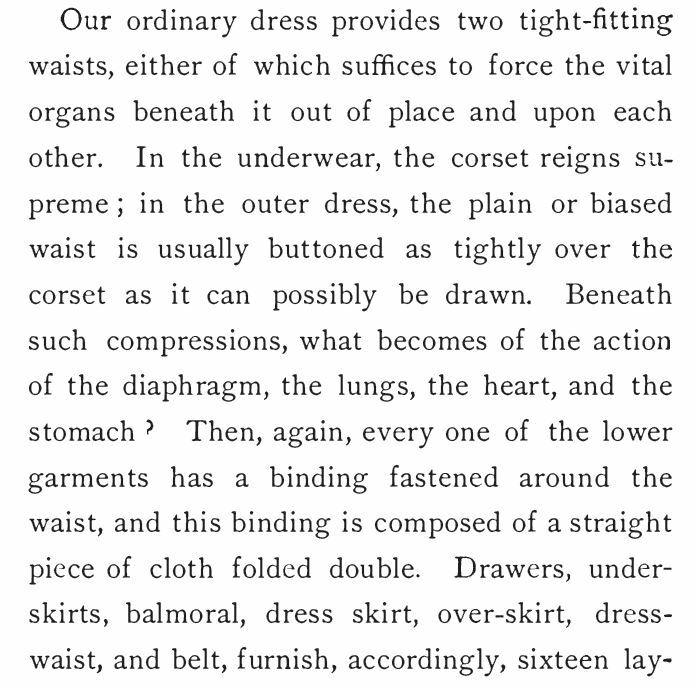 I can’t imagine wearing anything that constrictive for a moment or two much less an entire day. 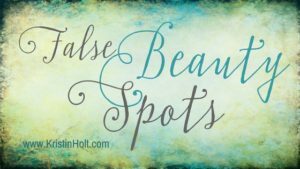 It’s amazing what women do for beauty or for what they think men want. 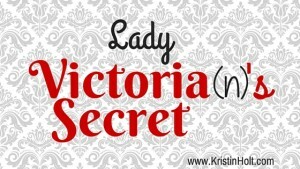 When my characters remove their corsets and take that first full breath, I will feel their relief. 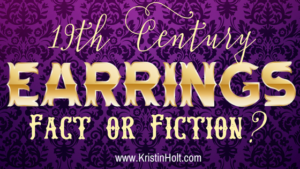 What an insightful response…for your characters to draw a full breath with relief when the corset is finally removed. Ahhh! 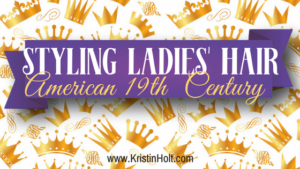 I’m so glad to be a 21st Century woman, through and through, though I do love learning about the 19th. Sounds like you and I have that in common. 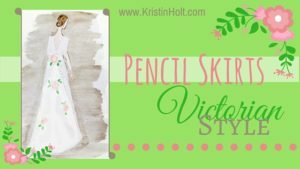 Kristin Holt is a participant in the Amazon Services LLC Associates Program, an affiliate advertising program designed to provide a means for sites to earn advertising fees by advertising and linking to amazon.com.